Gail Hamlin is an author, poet, associate publisher, and editor of over 30 reference books pertaining to Native Americans and U.S. History (published under Gail Hamlin-Wilson). She is the mother of four children and lives in New Mexico. 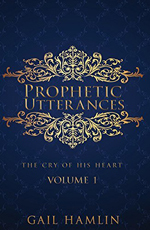 What are Prophetic Utterances you ask? They are a foretelling, prediction and revelation of things to come expressed by words, either spoken or written. In this case, these utterances are an answer to Gail’s prayer to give her something new to write that were inspired by God, and He did just that on two separate occasions years apart. The first writings lasted three days and three nights. The second set came eleven years later and lasted five weeks. Each of the seventy-two writings in this book contains revelation of God’s awesome wonder and elements of surprise. There were too many writings to put into one volume so more will be released in the near future.